After 10 years of ownership I am in awe of these boots. After 10 years of ownership I am in awe of these boots. I wish i could find their "little, lighter, more breathable brother" — but it doesn't appear to exist. Yea, they're costly at $225, but they last forever, support superbly, and are insanely comfortable (aside from heat). Here's a review after living with these boots a while — like TEN YEARS. They rock. Maybe it's me, or my feet, but in a mixed bag of real hiking, light use, and even around-the-yard stuff, these are possibly the most comfortable and supportive footwear I have — of any form — and this includes New Balance 993 running shoes, Alden oxfords, and other not-too-shabby stuff. I keep shoes a long time, and my Crestas have maybe 1,000 days of at least part-time use — 1000. Incredible support, great comfort, however, can be a bit warm in summer. Welcome to Trailspace, Grant. Thanks for reviewing your well-used boots. Got any pictures you could share of yours in your review? Shank not stiff enough; Toe scuffed badly after one hike; Upper lace hooks cut my finger. This is a review of the Fabric/Leather Cresta. I weigh 225 pounds. With a 40-pound pack the boot shanks flexed, transmitting unwanted surface contour sensations under my feet on/off the John Muir Trail in California. Been using Bean products there since the Reagan years. No fit problems using a Birkenstock 3/4 length insert. However cushioning was an issue arising in bruised and blistered underside of one big toe descending the Golden Staircase. Nobody makes a Birkenstock compatible innersole up to the job. Ankle support was beyond reproach. Carried the full pack over gnarly boulder fields up and down steep faces with no edging/ankle issues. Dry year in the High Sierra, so I never needed to remove my boots at any water crossing in over 55 miles of hiking. Dry as a bone wading in the boots. Fabric inserts around the instep kept my feet warm but comfortable even climbing out of the desert toward Taboose Pass in the afternoon. Drew blood pinching the thin skin at the base of my finger between the lace and its hook putting the boots on. No problems lacing for a good fit after that. No toe smash against the front inside of the boots descending. Leather toe section of both boots are horrendously scuffed for so few miles. Soles are acceptably, minimally worn. Grip on Sierra granite is first class. No problems across snow fields. Montagna bloc derivative tread pattern is a good feature. 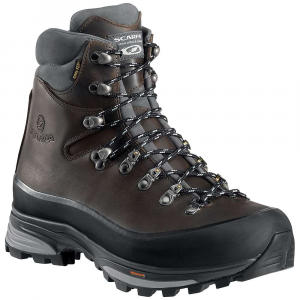 My biggest problem is that I own a resoled pair of Bean's Gore Tex Speed Guide Hikers (out of production) that have done over a dozen multi day high altitude hikes and several hundred 7+ mile day hikes climbing 2000+ feet that do everything better than these Crestas. 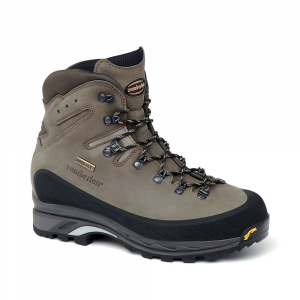 For safety's sake I bought new boots but they are a tough compromise to the point that I will go back to the Speed Guides I bought in 2003. They are barely scratched compared to the Crestas. Precipitous downgrade in lacing hardware from Speed Guide to Cresta is hard to get used to. Bean's markets these boots for multi-day backpacking, but I feel they are limited to marathon day hikes by the flimsy shank. 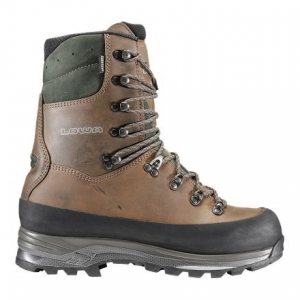 Frustrating because I really like fabric boots in my desert hikes. Thanks for the review, Revcounter. I've been invited to hike the John Muir in 2016. I'm curious if a full boot is required, as I normally use a light hiker? 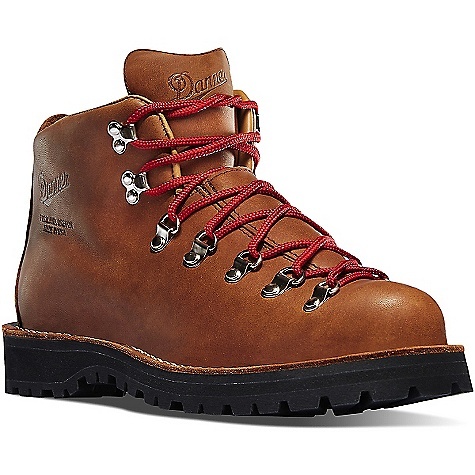 Just bought my second pair of LLBean Leather/Fabric Cresta boots to replace a pair that the sole lugs have been worn off on after one or two thousand miles of non-winter mountain hiking over the last four years. I have a high arch, a sort of wide toe region and narrow heel, and need a fairly stiff sole to protect my calcium clogged big toe joints from excess flexing--all of which are well accommodated by the 7.5 wide Cresta (Crestas are the only footwear I've ever had where a 7.5 is not too small, even though I measure 7.5--i.e. they truly run true to size). Other than the sole lugs wearing down, which is to be expected, the boots have endured very well. I hope the new ones, which are made in Croatia, rather than in Italy like the last ones, hold up as well. 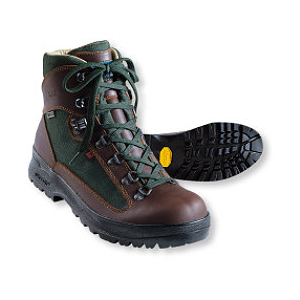 The boots are very comfortable for the 6 to 10 hours of mountain day hikes that I tend to do (bagged most of my 73 NEHH in them)-- I don't do much backpacking but they seem fine with a heavy load on the back also. 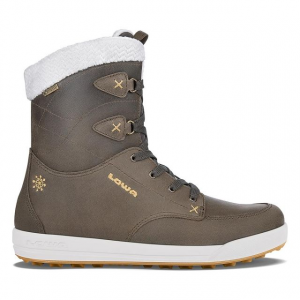 I also have a pair of all leather Crestas, a half size longer (8W), that I use for winter hiking with Smart Wool mountaineeering socks and a liner sock--my feet stay warm and comfortable all day no matter how deep the snow or cold the day. Looking forward to the next couple of hundred peaks in my new Crestas! 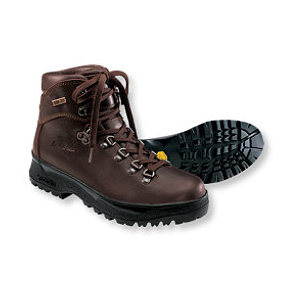 The L.L.Bean Gore-Tex Cresta Hikers, Fabric/Leather is not available from the stores we monitor. It was last seen April 17, 2013	at L.L.Bean.